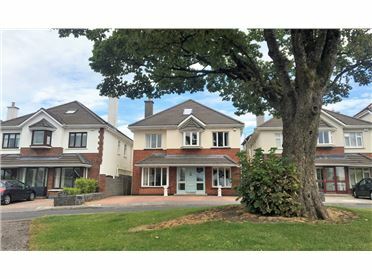 Maree Lodge is a luxury two story house, located just outside the quaint village of Oranmore, close to Galway city in the West of Ireland. Set on an elevated site surrounded with magnificent landscaped gardens, the property boasts spectacular sea views through the extra large windows. The oak floored living room boasts a lovely open fire, while the spacious dining room is complete with french doors opening on to an alfresco patio and decking area. A sun room with French doors allows panoramic view of Galway Bay and the countryside. Maree Lodge has a fully fitted country style kitchen with centre island and granite work tops and separate utility room. The vibrant city of Galway (15 minutes), has continuous festivals from June to September including Volvo Ocean Race, Art Festival, Galway Races, Oyster Festivals and many more. The par 72 PGA championship golf course designed by Christy Oâ€™Connor Jr, located adjacent to Renville Park with its many amenities, is 2km away and welcomes visiting golfers with very reasonable rates. Connemara and the Burren are both within easy reach and worth a day trip. The nearby villages of Oranmore and Clarenbridge have beauty salons, hairdressers and shopping, including antiques. .